In 2011, in addition to the beginning of the Urban Outfitters case with the Navajo Nation, Etsy was gaining momentum as an important marketplace for handmade goods. And, as an arts advocate, I saw big potential in Etsy for Native American artists to reach patrons and consumers throughout the world. 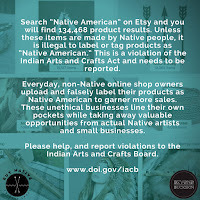 But, the label “Native American” holds great monetary value, and even the average person or shop owner on Etsy realizes this and they misuse these words or tags to name and describe their products to garner more hits when consumers search for handmade Native jewelry or art. This rampant mis-labeling creates a situation where you have thousands of non-Native people selling hundreds of thousands of products that show up when these terms are searched. It drowns out the authentic work made by the people who are ascribing to the Indian Arts and Crafts Act and who depend on it as a way to maintain cultural practices through arts creation as their livelihood. I have informed Etsy shop owners about this act, however, they just adjust the phrase “Native American” to “Native Inspired." In this way, they are within the limits of the law, and they still get their products listed in the search results for Native products. They can continue to sell their work and profit without being completely upfront and honest. Since the 1930s, we have known the positive potential of the arts as a form of economic development in Indian Country. We know that a third of all Native people are either practicing or potential artists, and this is a huge resource that we possess within our own people. However, we are currently being drowned out by big non-Native companies, as well as individual handcraft artists, who are all misusing these terms to further themselves at the expense of Native artists. These culprits include established non-Native businesses (like Pendleton, Ralph Lauren, Urban Outfitters, Minnetonka Moccasins, Forever 21, and basically any brand with a "Navajo" collection that has nothing to do with Native people, and so many others) who have built their empire off of selling "the Native" and selling a culture that was never theirs to sell in the first place. We have tried numerous times to educate consumers about the ethical aspects of this issue, as well as the economic aspects: if our artists can’t make a living off of arts creation, then they are forced to do it less, and artists are our culture bearers. Our artists are the ones that carry our unique and critically important cultural practices from the past and into the future. We live in a digital world, and a significant percentage of sales transactions occur online. The Indian Arts and Crafts Act, as it exists now, needs to be updated to include "Native Inspired" to better protect our artists and Native arts patrons and supporters. 1. Contact the Indian Arts and Crafts Board and ask them to update the Act. 2. 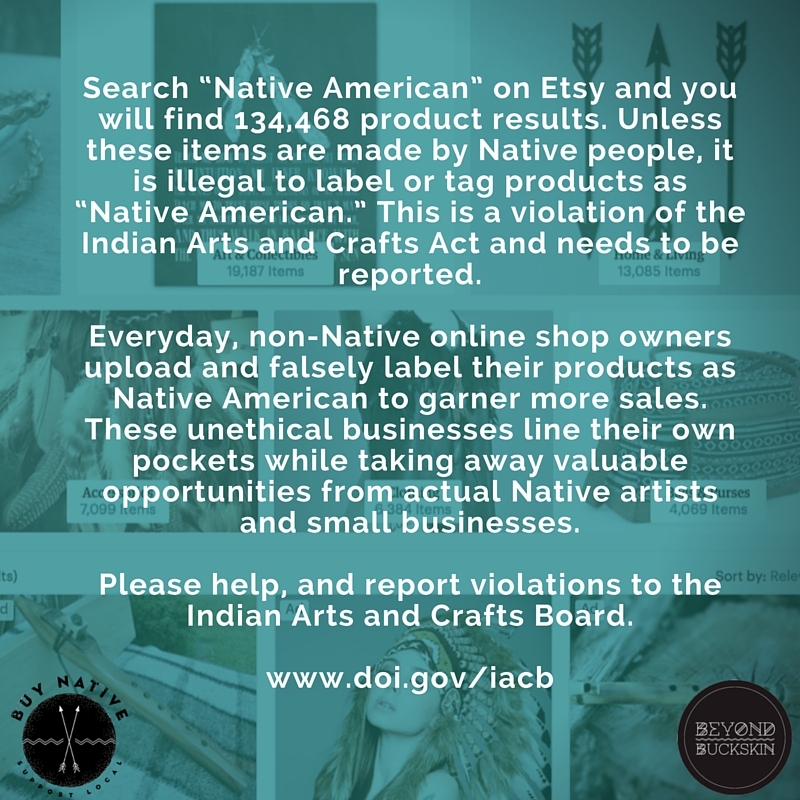 If you see a violator on Etsy (or anywhere), report them to the Indian Arts and Crafts Board. 3. Don't be afraid to ask a shop owner if the work is authentic. 4. Continue to support and promote authentic Native American made items. Feel free to share the image above left with your social networks. You can read more about my various critiques of Etsy here: Indian Headdresses Should Not Be on Etsy, Etsy Is A Breeding Ground, and Does Etsy Condone Trademark Violation? For the Native American artists who are on Etsy: I have tried to weed through the hundreds of thousands of shops on Etsy and to 'Favorite' the Native-owned ones for anyone who would like assistance in viewing a quick link and supporting this endeavor. You can view these shops at this link. This list is not entirely comprehensive - there is an ongoing cycle of new shops that open and close, but I try very hard to keep it updated. Also, some shop owners are just straight dishonest when it comes to their tribal affiliations; I am not the identity police, and I do not ask for a CIB or other form. I'm not an authority on this matter, I'm merely a Native arts promoter and supporter, and I know I am not alone in wanting to contribute however I can to the continuance of Native American artistic practices and creativity. And sometimes, promoting and supporting means acknowledging and minimizing the challenges that face artists. This is something I brought up t a friend a while back. I freaked when I saw the "Native Inspired" or in one case "Native Approved" like the woman had one friend that okayed her items and won't get into it from there. Another term I hate is "Pawn" as anyone who has been in a hard spot or gone into a pawn in IC knows the conatations behind that and it seems to sell items more and well as the idea of someone suffering and forced to give up a family heirloom to eat or get a relative out of trouble makes them enjoy the piece more. Etsy really doesn't care so long as it is making the money and have opened the doors to both the mass produced Chinese markets to sell there as well as the large animal skin traders from there and Russia. Hi Emileigh! Thank you for the message - I love your site! Keep up the great work! I have seen the same thing on Pinterest. This just illustrates even more the limitations of IACA in actually protecting the work of actual Indian artists. Now we need to make sure that ALL Indian people with verifiable proof of Indian blood and heritage are also covered under IACA, because that's not the case now. This is a tangent, I know, but how would you suggest someone go about listing a product made from regional native species materials without appropriating the search tags that should be leading to products by indigenous artists? I ask because it IS important to me when my crafts are made with California native plant (or animal, when legal) materials that I gathered myself, but I am NOT a Native American artist by any stretch, and would never pretend to be. Is that a thing where I should avoid tagging the word "native" entirely, or just make sure the tag is multi-word "native plant"? "I craft my pieces from plant and animal materials that I gather myself, following local laws and guidelines, in California." The Native American scene is where it's at and this Boho Necklace has what it takes! "Native" is an accurate descriptor for flora or fauna, and I think ALONE (without "Native American") is ok to use, but it depends on the item. And this is just me personally, but if I saw "Native Inspired", that would be an instant clue to me that it wasn't authentic, but rather just in a somewhat similar style. If I was looking for something authentic, I would certainly move on if I saw that. Having said that, if I was looking for a certain pattern style (like for a pillow, let's say), I would type in "Native American" because I honestly don't know any other description I can think of for what I'd be looking for. And therein probably lies one of the issues creating this problem. Because certain patterns, items, and styles have long been associated with Native Americans, most people probably don't know any other way to describe/search for/lead someone to that item. I am also looking at the Etsy not to buy or sell but I like vintage jweleies. I appriciate the people who sell vintage items to supporting these communities. I agree that it is ok to use ALONE. but some people have problems in that too!